It’s confusing. I’m having dinner at my transportation professor’s house. I met her early to talk about my paper but we had a change of plans and instead I just hung out with her 9 month old baby on the floor while she fed the worms in her compost bin. Here’s a photo from my studio presentation on Thursday. I photoshopped all the tears off of my face so instead I just look relieved and 2-glasses-of-champagne-later tired. Tomorrow is our final studio review. We are presenting a Transit-Oriented Development project for Market East, a transit rich area in downtown Philadelphia. I have slept 6 hours in the past two nights. Great work. The good news is I got to the dry cleaners tonight 10 minutes before they closed. The bad news is it’s 85 degrees. How am I supposed to wear my fancy slacks in 85 degrees? This is the beginning of the end of grad school. After tomorrow I have 1 research paper, 1 take-home final exam paper, 1 math homework, 1 math final exam, and fifteen high-fives to finish. 5:05-when friendships cut me offpm – acsweet drinks fifteen glasses of white wine. Steve made this. It’s my Penn Planning Yearbook Photo? Today is my last day of classes. I gave a presentation. Here I am with my sippy cup and my co-presenter, Dave, in my last class of grad school. Twinsies! I’m graduating in 21 days. I am a mess. Mostly because I don’t know what to do with my feelings. It’s like a blubbery mess of joy, fear, anxiety, and allergies. In other news: I found the Beach Boys Pandora Station. I hate the beach boys but the rest of the songs make me feel like I’m at a 24 hour bat mitzvah party complete with second-hand embarrassment memories of my mom dancing to La Bamba by Ritchie Valens at Adam Markovitz’s bar mitzvah at the Oak Brook Hilton Hotel. Good times. I’m going to Park Slope on Saturday to have dinner with my transportation professor who lives around the corner from Peter’s old apartment. This should do wonders for my feelings cocktail. I’ll probably start wandering the streets asking if anyone has seen the FreetZ and why Peter hasn’t brought me a chicken in two years. Can’t wait. The FreetZ got into her top choice for grad school! E.Dyke got engaged/into her top choice for a husband! GC Berna finishes her semester on Friday! And I’m going to Texas for the first 10 days of June. So. Yay. 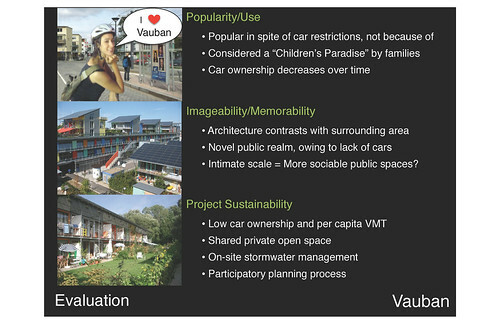 Jillian and Tony presented a case study about Vauban today to our Urban Design Case Studies Class. And here is a slide from their presentation. I’m famous? Here’s something to start the day off right: Quality reading from the Huffington Post don’t judge me I haven’t bought my NYTimes online subscription yet ugh. Most alarmingly, self-centered people were more liked and were also expected to like others more. In reality, self-centered people actually disliked others more, evaluating their peers more negatively! Therefore, while self-centered people may be perceived as more friendly, they are actually less friendly. – Who Is Popular at First Sight? or, how to get people to like you in 5 seconds. It’s been a long time since I’ve been up all night but it’s 2:17am and I’m doing math homework and drinking a frappuccino and highliting things in my statistics book like, “the liklehood ratio tests can be used to ascertain the significance of predictors to the model.” The bad news is this homework was due last Tuesday whoops but I was in Boston trying to get the jobs. The chair of our dept teaches my math class and he knows I was in the Boston trying to get the jobs so s’all good. In other news SarahSweeter was at the Coachella for the weekend. She lost her phone in the grass but then she found it at lost and found. That’s all I know so far. Here’s a conversation I had with my studio instructor today. (Background: I’m in a four person studio group and we are developing a TOD (Transit-Oriented-Development) Concept for the Market East Station on Septa in downtown Philadelphia). Instructor: Ok let’s see what you’ve done. 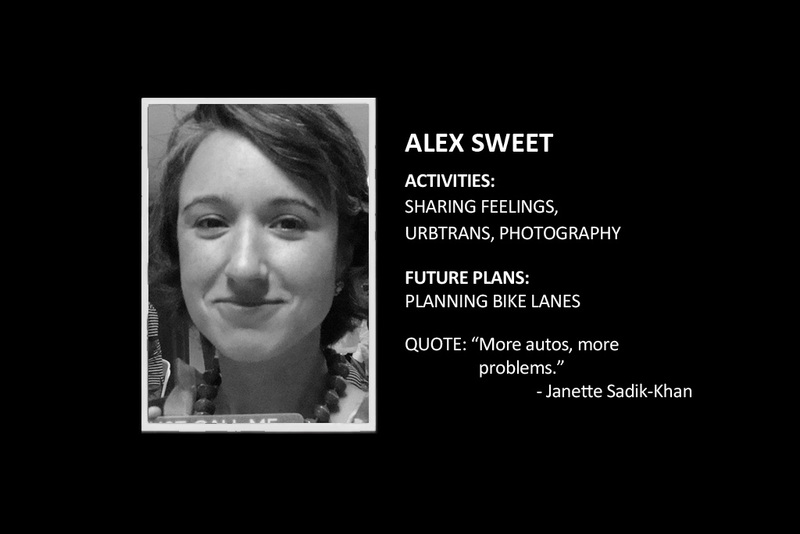 acsweet: Want to see my bike lane? I’m going to propose a center cycle track with three foot curb buffers, 10 ft through-lanes, 11 ft bus lanes, and 5 ft bike lanes and a center turning lane and near-side street lights what do you think? Instructor: Great. It looks great. I love it. acsweet: Ok I was going to do a plan view and a cross section and maybe a photo simulation, but so you also think I should I do a 3D rendering of it so people get a better idea of the perspective like they’re right there on the lane biking and feeling great? Instructor: I wouldn’t waste your time. It’s not critical to the project. acsweet: It’s critical to my future. Instructor: Ok you can do a 3D rendering after you graduate and you’ll get all the jobs you want. acsweet: Great thanks high five.